In our never ending quest for a better flowing TPI intake, we have the lastest results to report. You know what we have done so far. The new manifold and engine combination was tested on the DynoJet dyno this Saturday. The results, again have us scratching our heads. Not that they are bad, but we still have yet to achieve our goal of making more HP above 6000 RPM's. Judge for yourselfs, and feel free add your $.02. It would appear the throttle was lifted early, but that is not the case, when it reaches that point, it just goes flat (doesn't rev anymore) you can hear the motor go sour. The rev limiter is set to 6400, so its not hitting that. I think we are just hitting the limit of the horseshoe-shaped TPI runners. 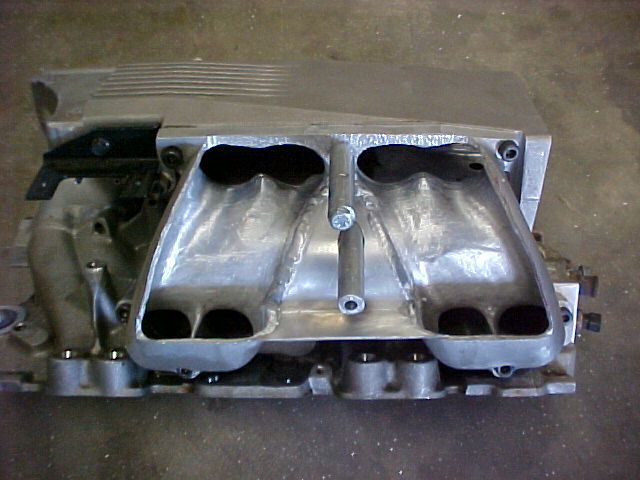 The intake manifold flows 315 cfm (up 55 cfm from 260 cfm) and the heads flow 260 cfm at 500" lift. The overal runner length of my siamesed SLP's is about 12-14", less than an LS1 at 17". 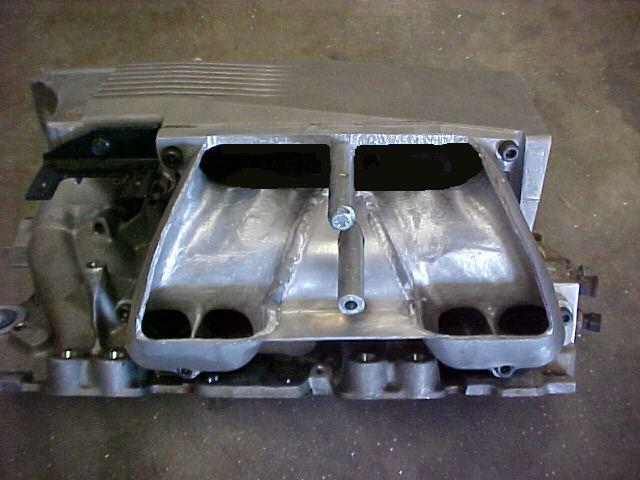 But a TPI intake has huge curved runners while an LS1 has flat curved runners inside the plenum. I dont get it, as I dont understand the physics of air that well. As you can see on Kevins motor the horsepower peaks around 5300 rpm and just flattens out. By the way his intake manifold flowed well past 300cfm. His SLP runners have had major surgery. Maybe only a couple of inches of runner left and a big plenum area. The question is why does the motor peak that early? Mine does the same thing. As most of you know my car has had a new and larger cam installed and new valve springs with a much higher seat pressure. We should be putting it back on the dyno in a couple of weeks to see what happens. If it peaks at say 5300rpm and the horsepower flattens out again I will be totally perplexed. After seeing Kevins dyno run I'm afraid that is exactly what is going to happen. This is why DynoDon is asking the question. We are looking for opinions as to why these motors are peaking so early horsepower wise. Do you feel the heads are a limiting factor? 260cfm at .500 lift aint bad, but could be higher to better match that intake. What are the specs of the cam? Valve timing events with custom cams may need to be tried to keep pushing in more air at those higher rpms. What you've done so far is very impressive. That flat power curve is nothing to sneeze at but i would think you would have enough flow and runner length to make more power over 5500 rpms. it seems 5500 is a kill point where no more power can be made. The theory of runner shape may have some real influence on how power is made. It could be disrupting the wave harmonics and preventing power being made up top. My cam is a Lunati 226/232 with .580/.565" lift with 1.6 rockers and 113 LSA. I know since your in cali and need emissions, it be hard to try different cams. I'm wondering if that 113 lsa is hurting alittle on the top end and the motor wants abit more overlap, like a 110-111 lsa. Your duration is good to make peak power at around 5800 or so, maybe abit more. Have you'll disabled double fire mode on the injectors? The engine might run better in single fire mode, running longer pulsewidths for more fuel. Like asynch with a TBI setup. We are using 30# injectors running around 80% duty cycle, 46# psi, 12.8-13.2 AFR. The 02 volts are @ 950-1000, it didn't like being leaner. I want to say 266 cfm on the heads just isnt quite enough and better heads/port work to get flow in the 280 range is what is needed. The cam looks good enough to make power in the 380whp range if only it kept climbing after 5300. The power was climbing good till the flatlining. Like was said above if the line on the dyno graph was carried out it looks like the motor would peak around 380rwhp in the 5800 to 6000rpm range. I suspect it has to do with something happening to the airflow. Just got to figure out what. Ok, so the Base will flow 315 CFM. Have you tested the entire intake system for flow? What throttle body do you have on there? And what are you using for a filter? Is it possible that the intake tract BEFORE the throttle body is the weak link? Ploegi. Good ideas but he was getting 100kpa in the plenum throught out the dyno pull. That would indicate the plenum was at atmoshperic pressure or darn close. The air filters were pulled. So something is happening to the air between the plenum and the head. Ploegi. Good ideas but he was getting 100kpa in the plenum throught out the dyno pull. That would indicate the plenum was at atmoshperic pressure or darn close. The air filters were pulled. Figgered it would not be that easy. Any thoughts on flow for the whole intake system? As manifold pressure was good, my guess would be that we are not seeing a problem of flow-limiting intake.... which would have been my first thought..... How about the other end? (I have not checked out the other thread yet, will do so shortly....) Possible that it cant pump the exhaust out? you have enough air flow to support 440-ish hp at the heads and the runners. The biggest thing that I feel holding you back is the plenum volume. It is just too small, based on my experience. The next thing up line is the volume of air between the filter and the TB. Since this would be for a dyno 'experiment', i would recommend cutting open the top of the plenum and welding on aluminum sheet to double or triple the internal plenum volume. Epoxy in a couple of horseshoe shapes in-front of each set of runners (try 1/2" tall) and shape them to 'look' at the plenum top. The other crappy thing you will be fighting against is air in the 'extended' plenums. Instead of pulling from the common plenum, the air gets pulled back from the extended plenum and has twice the mass (volume) to react to based on the next cylinder firing. This will cause a 'sluggishness' in the flow vs. just a shorter runner and all connected by the same volume plenum. Increasing the plenum size will help this out. You do have 1 and 3/4" headers, yes? I also believe that they are shorties? Long tubes would help with a tuned collector, but we live in the CRC. Hope that this helps. I was just over at DynoDon's and we were looking at the data logging. From all three cars on the dyno it looks like the dyno rpm numbers are reading 300rpm to low. Where Kevin's car was dropping off at 5800rpm on the dyno tach, the datalog shows it is around 6100rpm. Same with the other cars. So if that is true he was starting to make peak power at 5600rpm. That puts things in a little better perspective as far as peak power goes. Regarding the plenum volume it is extended well into the runners. There is nothing but a cover that goes over the runners as shown in the picture above. I figure on my setup I have extended the plenum volume by 50%. Last edited by 1989GTATransAm; 02-18-2008 at 05:01 PM. Also, we have another similar project using a SuperRam with the same results. The power just flatlines after 5300. Last edited by Dyno Don; 04-20-2009 at 03:25 PM. I understand that the top half of the 'old runners' has been ported out to an empty volume that has increased the plenum volume. But, you have created a 2nd-ary plenum where the runners were. To increase the original plenum, would lessen the effect of runner resonance to each other as the current state of design. They (the plenums) are acting like a pair of springs in series each with a different stiffness (k-factor). 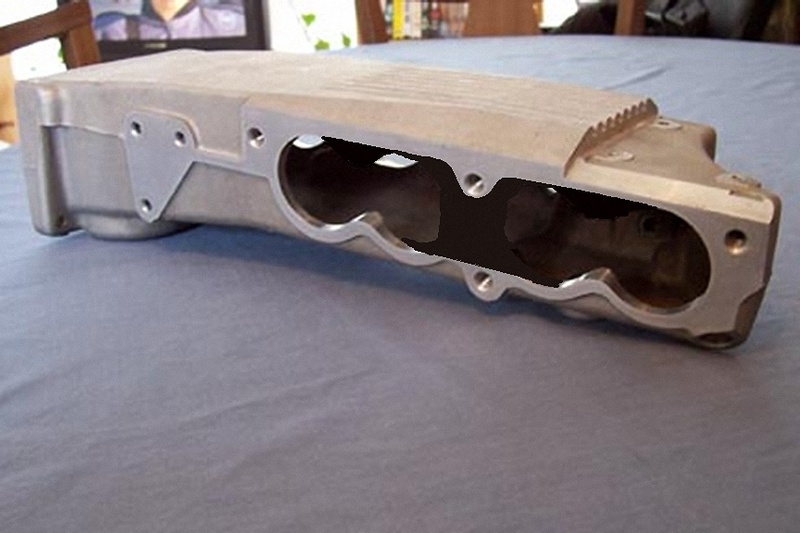 Guys, what is the cross section dims of the open sections of the runner plenums? Any idea on the radius of the horseshoe section? For giggles, I would like to run some numbers. Last edited by Zipdrive; 02-18-2008 at 06:46 PM. Reason: added question. I understand exactly where you are comming from. That is one of the reasons I made mine a little different and opened it up more at the top by the plenum. All four holes are now one big hole to create a bigger chamber in that area. A few things to think about. Normally the harmonic waves will change direction at the first open area. This is what occurs on a carburetor single plain intake manifold at the small plenum area. All eight ports empty into that area. On our modified TPI system we have something quite different. Working back from the head we have two ports that empty into one now siamesed port. The siamesed port is now slighly bigger in area than the combined single ports because the divider wall is gone. Then on Kevins the two remaining siamesed ports on each side open up into one big plenum area. Maybe a secondary one because of the way his entry area is constructed leading in from the main plenum. One of my questions would be does the siamese runner area act like a plenum or does it act like just a bigger runner. If it acts like a runner that would make for some interesting harmonics. Now one would think the speed of the air in the siamese runner area would be slightly less than 1/2 the speed of the air in each individual runner. That would set up two different harmonics. Maybe at a certain rpm it becomes a problem? The siamese area on my runners are longer than either Kevins or Dons and maybe has problems at another rpm range. My secondary plenum if you will is also different and I think less susceptable to harmonics and acts more like one big plenum in conjunction with the main plenum. Now if the siamese runner area acts like a plenum there should not be a harmonic problem. Can't wait to get back on the dyno and see what happens. Finding a tuning problem is often a game of eliminating what is NOT the problem. I don't want to quote all of that plenum and runner stuff, but do look at that last graph I posted. THAT was with a Super Ram and they look very similar, don't you guys agree? Those are two different runners systems (one long & one short). Last edited by Dyno Don; 02-18-2008 at 09:28 PM. What was the cam used in that superam? that may have made a difference. The intake manifold itself could have been the limiting factor on the Super Ram. Was it not Extrude Honed? I bet it flowed a good 40 cfm less than Kevins. Maybe even 50 cfm. Yes, it was honed, as were the runners. The Super Ram has 17" runners, the modded (Kevin's) one tested is about 2" of runner. Yep a large tube test would be nice to see. Just so many variables to test here. That is an interesting thought, we have some of those. The last engine we tried those on was a 350 with ported 113 heads. It put down 318-420 with the LT4 Hot cam. Here is another one to ponder over. (1000 CFM, 30# inj.) and LT4 hot cam. It is using a '7730 'puter. Maybe none of us have enough cam. Last edited by Dyno Don; 07-09-2009 at 10:18 AM. The engine does not even make it to 6k on the graph, are you still having accuracy issues with the RPM reading? Will the engine spin higher without scattering parts around the room? heavy hydraulic lifters limiting your RPM? its hard to say which one, or more than one, it could be. You can try running a rev kit on one of the engines, which would simultaneously rule out heavy lifters or not enough valvespring. you definitely have the airflow to support more HP. out of curiosity, has this dyno been used on vehicles with more HP than these cars? possibly an issue with the dyno? bad load cell or something? that 388 with the hotcam is about what i'd expect from a hotcam on that motor, 5500 rpm peak or so. "Maybe none of us have enough cam." That is looking like a true statement with our 23 degree heads. That was also stated on another board where the big shots hang out when I posted the problem. The LS1 guys with their 18 degree heads and the latest technology do not need as much cam to make the same horsepower. The LT1 guys have much shorter runners and reverse flow cooling. They can run higher compression and wind there motors up higher. However they do not make as much torque either. They also lag behind the LS1 guys and we bring up the rear with our L98's. Makes it more challenging. This is one of the reasons I want to get my motor back on the dyno. I now have 10 degrees more duration at .050" and with the new valve springs I'm going from 95-100# seat pressure to 150# seat pressure. Specialized coatings is still not done with my intake system. Maybe Wednesday before I get the parts back. Hopefully Kevin can find some time on a Saturday in a few weeks so we can make some more dyno runs. I know of three cars that are ready and one of them is Alex. One will require no tuning as it is a 69 Chevelle and just wants a base line pull. Jwscab. Thank you for your insightfull comments. Kevin does have a AFR rev kit on his car. Regarding the non-homogenous fuel remember these are fuel injected motors and the fuel is sprayed into the back of the intake valve or darn close to it. So it is dry air until it gets to the head. I think you and Don are probably right on the cams. In a couple on months there should be another motor with an XFI280 cam comming online. It will be interesting to see what it does. MadMax has an XFI280 cam on his car but in is running stock runners. Puts down good power though. I have been harassing him on getting a better intake. It will be interesting to see what the BBK system does. It does have 1.70" inside diameter runners which may not be all that bad. We will have to wait and see what the intake manifold looks like. That might be what makes or breaks the deal on it. Orr89RocZ the 388 motor that Don posted looks good for you combination. You should be able to get your 400rwhp with your combination. You will have better heads and a bigger cam. I'd love to see the 280xfi on your modified TPI setups. I think it would be a great match. Else throw a CC306 on there to see how it does, even tho i dont think it will pass emissions. Love to see the outcome of this one. But isnt your cam similar to Kevin's? The last graph that Don posted I think shows the issue. We have run out of cam. An LT4 hot cam has 210/228 at 0.05" The power band should stop around 5600 rpms. Need more duration. Allen has a larger cam going in (or is in? ), what are the specs for it? dang, i go for a meeting and come back and 4 more post are up. I'm obe. The new cam and springs are installed in the motor. Waiting for the intake parts to come back from Specialized Coatings so I can button up the car. Should be done this week. im thinking off the top of my head here, so don't shoot me. if you see the same results with the motor with the bigger cam & if you think it is a flow problem with the intake, you could drill & tap the base for a vacuum fitting down near one of the injectors. i don't think there would be a problem with the MAP plugged in there for a WOT pull & see what its showing. or better yet wire in a second known good MAP hooked up to the fitting & data log it. if you use 2 MAPs & there is a difference, verify the MAPs by swapping them around for the next pull. i know there isn't much meat to tap into by the injectors, but just doing it as a test & welding the hole up later i don't think would hurt. of course i don't have time or money invested in my intake like any of you do, so its just a suggestion. Here is a link to a web site a lot of us have visited before. I think a revisit is in order. Particularly look at the moded TPI horsepower dyno graph on the Vigilante 2800 converter test. Does the flat line look familiar? Ours is nothing compared to that one. Some interesting dyno graphs on the Holley Stealthram and other tests worth looking at. The test were run with AFR 190 heads etc. We should do better with the newer products now available. its interesting to see how the vig 2800 makes the power peak earlier and still flat line alot. I wonder if it was locked on that run? The computer is set to lock the torque converter at 75 MPH. Since we have to start the pull at 75 MPH to keep it from down shifting, it was locked. Last edited by Azrael91966669; 02-19-2008 at 11:04 PM. Look at the picture in post #9 again. The runners are completely open to increase the plenum area. kevin here is what i mean wouldnt this open it up far more? Last edited by Azrael91966669; 02-26-2008 at 03:39 PM. i dont know how much that will help, as its common for engines to have plenum volumes of 50-70% of your cubic inches. for a 350, thats 175-245 ci of plenum volume.